By Charnita Fance in Desktop. Updated on February 20, 2019 . When you are surfing around the Web, how often do you come across an image, video or text that you want to share quickly with a friend or on your Facebook or Twitter profile? I’m sure it happens quite often. When that happens, I doubt anyone will enjoy having to search for a tool or go through 4-5 steps just to share a simple image or video. It will be awesome if all these can be a click away! Imagine having these convenient tools all at your fingertips that makes everything faster and easier for you before you lost your interest and also while you are still surfing. Well, this list of image and file sharing tools we have collected will show you some of the best tools for sharing screenshots, images, videos and text on the Internet via desktop tools and browser extension/add-ons. Full list after jump. If you’re looking for a great desktop tool for sharing screenshots, Jing is an excellent choice. You can clip any part of a webpage or even your desktop. Jing then gives you the option to share it via Screencast.com, Facebook or Twitter. If you prefer, you can save it to your computer than then upload it to your blog or any other site. You can also add annotations like arrows, text, highlighting and shapes to your screenshots. TechSmith, the makers of Jing, also have a tool called Snagit. With Jing you can even open up your screenshots in Snagit for further editing; they have a ton of options on Snagit and it’s one of my favorite desktop tools. Jing is available for Mac as well. If you are familiar with CloudApp (which is mentioned below under Mac apps) then you already know how FluffyApp works; it’s actually the Windows version of CloudApp and a tool that makes sharing almost effortless. With this app you can share images, videos and text anywhere on the Web within seconds. Just drag the item you want to share to the notification icon and you’ll immediately have a short URL for the item saved to your clipboard. You can then share the link on Facebook, Twitter, IM, via email or anywhere else. Plus, you can manage your files via the web interface. Right clicking the notification icon will show you the last few items shared and will give you quick access to the Web interface. Raindrops let you use CloudApp via a keyboard shortcut setup by you. These extensions work in other applications like your browser, iTunes, iPhotos and more. Other than that, sharing is the same; just drag the item you want to share to the menubar and paste the automatically copied link to the place where you want to share it. To me, this tool is like a cross between Jing and Snagit (both mentioned above under Windows apps). When I first got my Macbook Pro it was one of the first tools I had been dying to try, and did. It really does have tons of features. You can capture screenshots and then edit, crop, annotate, share and have conversations around those screenshots. You can share your screenshots on Flickr, MobileMe, Twitter, Facebook, blogs and more. This tool is a lot like CloudApp (mentioned above). You can drag and drop content to the menubar icon, after which a short URL will be automatically copied to your clipboard. It goes a step further by letting you share the item on Twitter with the click of a tiny button. You can also capture screenshots and compose new notes right from the menubar. Also like CloudApp, there is a Web interface for managing your shared content. Every account comes with 1GB of free storage, but if you agree to let them send out a tweet about the service (from your account) they will add an extra 1GB to your account! This “web app” is basically just a link to the Ge.tt website, but it’s still a really great tool for sharing files extremely quick. As the site says, “With Ge.tt you can share any number of files, no matter how large, within seconds.” Select your image and within seconds it’s uploaded. 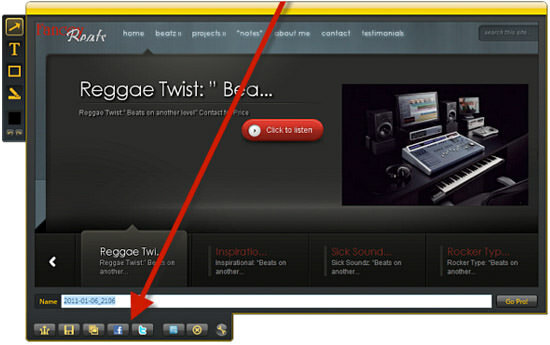 You’ll then get a short URL for sharing or you can use the one click sharing buttons for Facebook, Twitter and email. Unless you create an account, your shared files will expire in 30 days. This is a tool for taking webpage screenshots while surfing on Chrome. There are two options: visible screenshot (only snaps the visible portion of the screen) and all page screenshot (snaps the full page). You can add annotations like lines, text, shapes and arrows to the screenshot. Screenshots can also be cropped, saved, shared and printed. Sharing is done by clicking on the share button and then choosing a place to share. The current options for sharing are: Facebook, Gmail, Hotmail, MySpace and Twitter – or you can use the direct link to share anywhere else. This tool is quite similar to Webpage Screenshot (mentioned above). You can take screenshots of only the visible part of the page, a defined area or the entire webpage. 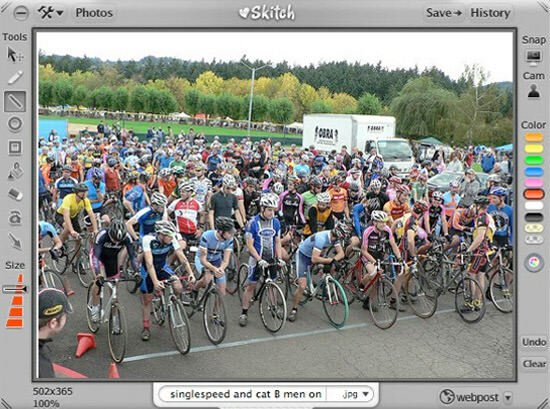 It then gives you the option to edit (via Pixlr.com), share (via Imm.io) or save (to your desktop) in a couple of clicks. If you choose to save it, you’ll be taken to the direct image on Imm.io where you will get a link for sharing. Other sharing options include: Digg, Delicious, Reddit, Twitter and StumbleUpon; you can also “like” it on Facebook. Imm.io also lets you see how many views you have on an item.